RUSH: Let me retrace some steps here very briefly, remind you of how this current climate actually began. The climate of spying on Americans domestically and being able to leak news that you want published almost verbatim to the media from the intelligence community. This, the Trump-Russia collusion special counsel investigation is actually the third go-round for this. The modern incarnation of this began with Obama and the desire he had to spy domestically on opponents of his Iran nuclear deal. Now, this has all been detailed at a website called tabletmag.com and the great writer, Lee Smith. I have two different places I save websites. One’s Pocket. The other ones the Safari reading list. But, anyway, they ran a trial, did a trial run of something in the Obama administration. They gave intelligence community people tidbits of information to select journalists to see what would happen, to see if it would appear and to see if it would appear verbatim. And one of the first journalists that was tested was somebody named Adam Entous, who works the Washington Post and is I think at The Atlantic or some other magazine. The objective in the first go-round was to use the spying apparatus, the NSA and others to collect information on Americans, domestic opponents to Obama’s Iran nuclear deal, including journalists who might have been opposed to it, to see if they could get away with it, to see if anybody would express outrage that it happened. And they got away with it. And even when a Fox News journalist, James Rosen, was discovered to have been spied on by the Obama administration, the Drive-By Media didn’t say a word about it. They didn’t care. It’s a Fox News journalist. 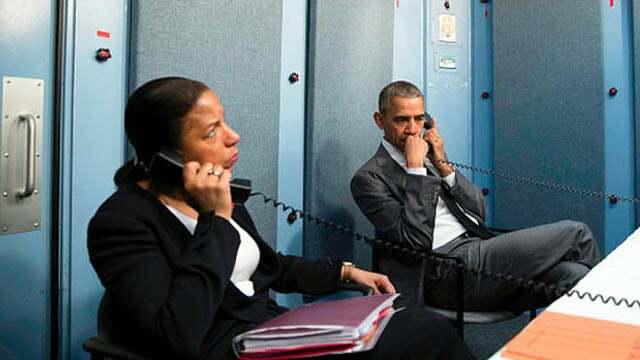 Now, you can call it deep state, you can call this whatever, but this was the Obama administration and their authoritarian bent to get done what they wanted to get done by virtue of intimidation, i.e., spying and then leaking information about people that they had collected information on. RUSH: Okay. If you really want to read about all this in great detail, it’s great. Lee Smith at tabletmag.com. They call it The Tablet website, but it’s tabletmag, one word, dot-com. And there’s two or three different pieces that are all related to that which I was just discussing. 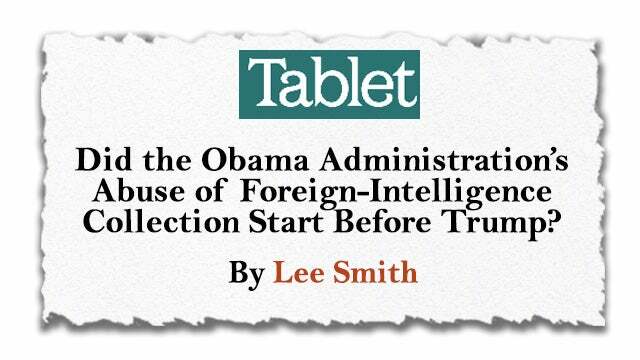 Tablet: Did the Obama Administration’s Abuse of Foreign-Intelligence Collection Start Before Trump?